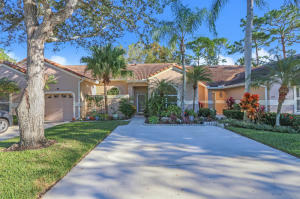 View all current homes for sale in Heather Run, Palm Beach Gardens, Florida. Click on a listing to the view property details, photos and maps. If you would like to change or expand your search criteria, go back to the Palm Beach Gardens search page, or try using our Advanced Search. Stunning 2 BR / 2 BA home in the highly sought after Heather Run, at PGA National. Gorgeous chef's kitchen recently remodeled with KraftMaid cabinets (soft close), Quartz Cambria - Berwyn counter tops and equipped with GE Profile appliances. Master & Guest Bathrooms tastefully renovated with Imported Italian Marble Tile & frame less shower doors. Lanai was converted into the Den, adding approximately 165 sq ft of living space- very unique to all other two bedroom floor plans! Rheem classic water heater replaced in 2017; AC replaced in 2011; Barrel tile roof replaced in 2010.